The location of your office or your company is a key decision for the positioning and performance of any project, even with the entry of new technologies, and this decision can have both professional and personal consequences. That’s why we chose El Cabanyal neighborhood, a place that combines quality of life and professional opportunities. In addition, we can boast of being the only coworking space in the new fashion district in Valencia, steps from the sea, the beach and the port. At least for the moment. 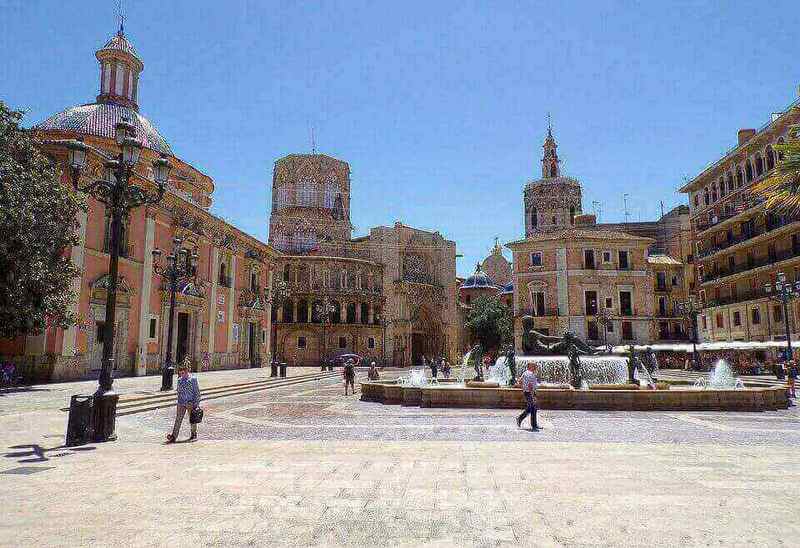 And why can we say that El Cabanyal is the new fashionable district in a city as important as Valencia? Ruzafa is the established fashion district without a doubt, but El Cabanyal is, in addition to an old fishing district with history and artists, a popular destination among tourists, it is on the beach and is located next to the Valencian entrepreneurship epicenter,la Marina Real and the port of Valencia. Therefore, it has history, art, technology, innovation, professional opportunities and an authentic and unique charm. Then we tell you what we consider the top 10 advantages of living or working in El Cabanyal. There are many neighborhoods in Valencia, but not with beaches. The beach of El Cabanyal is an urban beach, with low-rise houses and can boast of being the beach where renowned artists such as Sorolla, Blasco Ibañez, Goya and, even, Hemingway walked in their time. It is a clean beach, with well-groomed sands and no sewage. The promenade borders the beach passing through La Malvarrosa and reaching La Patacona. You can enjoy the irregular framework generated by the different houses and buildings of one, two or three heights and the restaurants arranged along the promenade. In our coworking space it is common for members to come to the beach to make a “break” during the workday, including some taking a bath. It is also a destination to enjoy some afterwork that we organize for the community, or spontaneous afterwork among the members. The value of a neighborhood is defined by its people, its neighbors and the life that is born from the relationships that are built between them. The neighborhoods are marked by their location, their physical conditions and the possibilities that are generated around them, but it is the people and their energy that can change a place. And El Cabanyal is close and familiar neighborhood, characteristics of the Spanish and Mediterranean culture, fundamental for the well-being. Go out and be greeted, meet you or ask you how your weekend has gone; to address you with “Buenos días rey/reina/cariño”, the closeness, selfless help, all this present in any scene in the neighborhood El Cabanyal. Values that we also promote in a coworking space. Valencia is consolidated as an entrepreneurial ecosystem. The VLC Tech City brand is committed to an innovative city, technological development and a sustainable and intelligent economic model. That’s why Vortex Coworking chooses a location like this, right next to the port of Valencia and the Royal Navy, of the Valencian entrepreneurial ecosystem; to be part of this environment full of knowledge, innovation and opportunities. Valencia hasLa Marina de Empresas, promoted by Juan Roig, recognized businessman and honorary president in EDEM. It is formed byEDEM (School of Entrepreneurs, Valencia), Lanzadera (accelerator of startups) andAngels Capital (investments for sustainable development of companies); three environments that complement the best conditions for individual growth and talent. It is a traditional neighborhood, but also bohemian and extravagant. It is a symbol of the resistance of the people and at the same time it has a bohemian, artistic and beach atmosphere reminiscent of Venice Beach in Los Angeles. In his annual calendar he has written down a series of key dates that give him a point of singularity that you will not find in other areas of Valencia. “La Semana Santa Marinera” is a Festival of National Tourist Interest since 2012. The municipal market, the street markets and the market of Kings bring you even closer to the people of the neighborhood, their product and their customs. The day of Portes Obertes (open doors) brought you closer to the typical houses of the neighborhood through art and culture. And of course “Cabanyal Intim” that offers a wide cultural agenda for all its neighbors, with some performances held in private and local homes. In our entry “6 key dates in El Cabanyal” you can find more details. Spain is known throughout the world for its gastronomy and Valencia is one of the cities marked in the list of must-see visits for any lover of good gastronomy. And in El Cabanyal you can discover new ways to mix traditional cuisine with the creative and the contemporary. It is not a neighborhood of exotic restaurants, Japanese, Chinese, Mexican, etc., at least for now. But yes of places to take the vermouth, the “esmorsaret” (little lunch) and restaurants and wineries with quality wines, fresh and local produce, tapas and rations that will surprise you and a treatment that will invite you to come back. Among all the options we have in a neighborhood like this, our coworking space highlights mythical and traditional restaurants such asCasa Montaña, Anyora or Casa Guillermo; the essence of the neighborhood reflected in Mar d´Amura,El Ultramarinos,ElViento Bar,La Peseta,La Paca,Taska LaReina orLa Pascuala. If you have opened your appetite and need more detail of what each of these pieces of life of El Cabanyal offers, you can continue reading in our entry dedicated to this topic“10 restaurants to eat in El Cabanyal”. The architecture of El Cabanyal is characterized by its ceramic facades with tiles and striking colors, low-rise houses and each one different and that joins the urban art that takes over some abandoned streets and facades: streetart, graffiti, murals and graffiti adorning the empty walls of unused buildings or the walls that limit many of their plots. The neighborhood is recognized as an Asset of Cultural Interest. Its particular architecture has its origin in the old fishermen’s barracks, with narrow facades, perpendicular streets. Constructions that were born in unoccupied lots, the result of the destruction of the neighborhood after a fire at the end of the 19th century and which led to the appearance of new houses at two heights with abundant modernist decorations and unique tile coverings and many examples of Art Deco. Related directly with the previous point, the architecture, we can talk about the perfect orientation of El Cabanyal for everyday life, since it has a North-South oriented plot designed so that the fresh wind can flow and enjoy the pleasant breeze summer that gives us the proximity to the sea. During the day, that fresh wind will run from the sea to the land and, at night, the opposite direction, which allows a pleasant temperature during most of the year. 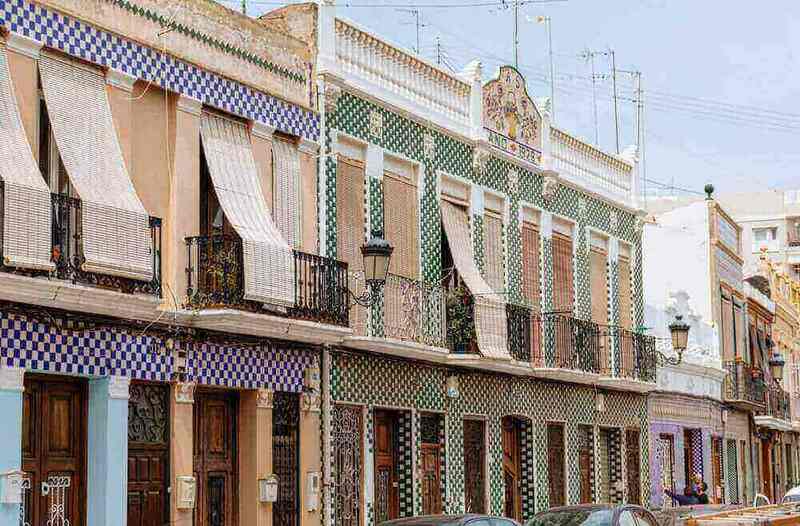 In addition, thanks to the fact that the houses are low and with direct access to the street, it allows to cool not only the neighborhood, but also part of the city of Valencia. Its current form is the result of the Mediterranean tradition and common sense, hence its preservation and protection over time. In El Cabanyal there is leisure and culture day and night. Concerts, art, poetry … one of the most fashionable venues in Valencia is the Fabrica de Hielo, an old industrial building converted into a bar and a cultural space where they organize a large number of events, concerts of all kinds of music, workshops and exhibitions. photography, thematic days or presentations of books and reading clubs. Flamenco Concerts in Mar d´Amura, Jazz in ElViento Bar are just some of the cultural and leisure contrasts of the neighborhood. Valencia was the birthplace of illustrious artists in Spain such as San Vicente Ferrer, Benlliure, Joaquín Sorolla, Manuel Candela, Vicente Blasco Ibáñez and Juan Luis Vives, and it is planned to open a cultural center in the former Cabanyal slaughterhouse in the heart of the neighborhood (in ground zero), where a historical archive of the Maritime neighborhoods will be housed, temporary exhibitions and a series of cultural activities that will enrich the agenda of the entire neighborhood. Having the beach so close opens a wide range of sports possibilities. You can practice sailing, windsurfing, paddle surfing, surfing (if you have read correctly, not always but sometimes we get good waves), volley ball or simply play shovels. In addition to water sports, the promenade and the dock is an ideal place to train for runners or to ride a bicycle. In our coworking space we try to take advantage of these opportunities and organize outings to run at dawn (with the sunrise over the sea) or at sunset and Stand Up Paddle thanks to our friends from SUPLIFE Valencia.. In the neighborhood sports activities are organized, highlighting the most summer 4k known as the “Volta a la platja València”, which translated into Spanish is the “return to the beach Valencia”. A very special tour since it takes place in the beach itself, which allows the youngest (under 14 years old) to participate in a previous race called the “volteta” or “vueltita” (little run). In addition, the Municipal Sports Federation offers a multitude of free activities on the beaches of Valencia that include yoga, Pilates, Latin fitness and even Tai Chi. Living or working near the sea entails a series of benefits for the health of your lungs or tension, your brain and your body in general, as well as other advantages on an aesthetic level. But not only offers benefits to your body but also to your way of life and your attitude to life and work, they even say that greater opportunities arise both in social relationships and professional opportunities. In summary, we already knew that Valencia is a great place to live and work because of the many advantages it presents such as the cost of living, the quality of life or the climate, as we already mentioned in our entry “10 advantages of living/working in Valencia”. But especially El Cabanyal presents a series of additional benefits as a neighborhood to live or work in this beautiful city. If you still do not know the neighborhood or us, head for our coworking space, you will fall in love with this special and safe atmosphere that you will want to return. Valencia is the third most important city in Spain behind Madrid and Barcelona, ​​with a cost of life significantly lower than these (15-20% less depending on the study). It is even below that of other major cities such as Bilbao, Mallorca or San Sebastian. This not only translates into lower costs to live, but lower business costs such as salaries, offices or coworking, events, etc. Valencia is well connected to the rest of Spain and Europe, since it has an airport, railway, port in the Mediterranean Sea and a road network that connects Valencia with the main Spanish cities by highway. For Madrid and Barcelona is connected as follows: the high-speed train (AVE) connects Valencia and Madrid in 2 hours with trains running every hour; and Barcelona ​​with the EUROMED rail service, in little more than 3 hours. In 2019 the high speed AVE Valencia – Barcelona service is expected to be operational. In addition to train connection, Madrid and Barcelona can be reached by motorway or highway in 3 – 4 hours from Valencia. According to the Airports Council International (ACI), the airport of Valencia was the fourth fastest growing European airport in 2017, offering more than 80 countries of destination. The port of Valencia is the main port of Spain in container traffic, the first in the Mediterranean Sea and the fifth in Europe. It is a direct connection between the city and international foreign trade. The city has more than five hundred startups, 15 incubators and accelerators of importance at national and European level (Lanzadera, Plug&Play, Demium Startups, etc. ), top-level business training schools (EDEM) and a large number of events on innovation and technology along the year. The Marina de Valencia is positioning itself as the center of the entrepreneurial and innovation ecosystem, not only in Valencian but also in Spanish and Internationally. VIT Emprende presents the city as “VLC Tech city”. And finally and perhaps most importantly, there is a good pool of local talent thanks to the high level of education of universities and schools. At the Polytechnic University of Valencia, companies such as Zeleros were originated; created by the founders of the UPV team winners of the international competition organized by the visionary Elon Musk for the design of the Hyperloop sponsored by SpaceX in 2015. Currently we can find more than 60 coworking spaces in Valencia. Coworking space is the office of the future, they say. New cities need intelligent, collaborative and flexible spaces ready to house new business models and new ways of working. Spaces where to meet, organize events, locate your office based in Valencia. The construction of a community of professionals where synergies and opportunities arise increases the idea of ​​an important collaborative professional structure in the city. Valencia hosts events from all sectors and especially (and in recent years) in technology and innovation; Artificial Intelligence, Blockchain, Industry 4.0, SmartCities, etc. Startup Sesame, the largest community of event organizers in Europe, has already decided to open the call for the fourth edition of its acceleration program from Valencia in the Startup Sesame Summit last March 2018. Recently Valencia has submitted its candidacy to host the Web Summit from 2019 onwards, one of the major technological events in the world, focused in creating a better society from the economic and financial side to sustainability and well-being of the society. Valencia has a mild climate most of the time and enjoys 300 days of sunshine per year (which does not mean hot). There is winter season with skiing opportunities not far away; but winter is mild as the Mediterranean Sea softens the temperature; Spring and Autumn are said to offer the best tempertaures and Summers are hot, inviting you to enjoy the beach and the sea to refresh your days. This beautiful climate facilitates social and happy culture, outdoor sports … and better health. The Mediterranean diet is well known worldwide, healthy and rich in natural products: olive oil, vegetables, fruit and fish. And, of course, the paella and other rice base dishes as the main actor. Known internationally as the traditional dish of Spain, paella was born in Valencia and is typical of this region. The Albufera of Valencia is the rice field of Spain, like Vietnam is of the world. But in addition Valencia also produces good wines in the area of ​​Utiel and Requena, and is the region for orange and lemons trees in the country. Living and working near the beach is full of benefits for physical and emotional well-being. Pure air, vitamin D and “Vitamin Sea”, natural light. The option of practicing sea sports any day of the year such as swimming, paddle surfing, kite surfing, windsurfing, kayaking, sailing, even surfing on some days of the year (yes, you read correctly!) … and we have mountains as well! The city is flat, but driving inland it becomes one of the most mountainous regions of Spain; Naquera, Sierra de Calderona, Sierra de Espada, etc. For that reason in Valencia there is also strong culture for mountain sports, hiking and cycling both road and MTB. The city has an optimal size, without long distances to travel by car or traffic jams; the possibility of cycling for work, or around the different neighborhoods, crossing the city pedaling along the riverbed, or even walking. Something that those of us who have lived in large cities appreciate as if it were gold. Despite its manageable size, Valencia offers culture, art and history as (almost) any big capital; the Historic Center with architectural treasures on each corner such as La Lonja, El Mercado Central, Las Torres de Serranos and Torres de Quart, etc; The City of Arts and Sciences, an avant-garde complex on the riverbed, which houses museums, operas, classical music concerts, festivals, and endless cultural, artistic and leisure offerings; and finally the Marina de Valencia, the new focus of development in Valencia, the TecHub and Cultural center next to the sea; in Vortex Coworking we have opted for this area, next to the sea and the entrepreneurial ecosystem. The city has metro, tram and buses that allow you to comfortably circulate throughout the city using public transport. To move around the city the bus is the most usual, and metro for longer distances being Marítima-Serrería the stop that brings the beach closer to the center; the tram is popular in the sea area and connects the different beaches, the universities and La Marina. And finally, our favorite one: VALENBISI, a bicycle rental service with stops distributed throughout the city to take or leave the bike. The most sustainable vehicle of all, economic and healthy that, thanks to Valencia being a flat city ideal for pedaling with a mild climate, it becomes an option to consider for every day. A luxury of those that do not cost money and that very few cities can offer. We believe that few cities offer such a balanced combination of professional opportunities and quality of life, perfect for those with both professional and personal ambitions. To these 10 advantages of working in Valencia we just need to add one about working at Vortex Coworking among all the options of coworking spaces in the city. And thinking about it … of all the advantages listed, there is only one area where you can enjoy all of them at once … our area, the Cabanyal and the Marina de Valencia. If you have doubts about it … come and see us and we will discuss it!